Back at Steed's flat, the two practice Judo. 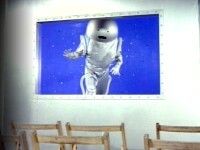 One of Steed's colleagues is killed on the grounds of an unusual academy. Posing as man and wife, Steed and Tara investigate a school created to train future astronauts for the purpose of conquering outer space. 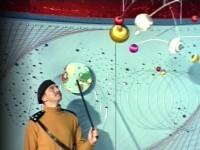 Plan 9 from Outer Space meets classic Star Trek, right down to the Trek uniforms and Plan 9's curtained space station control room. If all Tara King episodes were this bad, I wouldn't have bothered reviewing any of them. Doubtless one of the worst classic Avengers episodes of all time. Alpha Academy was actually Knebworth House, Stevenage. Originally one of three episodes produced by John Bryce, this one serves as a good indicator why Brian Clemens and Albert Fennell were brought back. Unfortunately, contract obligations with the Americans prevented them from ditching it altogether. With the possible exception of "The Sell-Out," this is the only time during the original series that Steed drove a contemporary sports car (an AC 428 Convertible), which was intended to be his standard mode of transport for the King era. Fortunately, someone came to their senses, let him have his vintage cars back and gave the AC 428 to Tara.